Updated: October 18, 2006 Family photo added; text cleaned up a bit. Thompson BROWN, b. August 21, 1868 - married Martha Wright, worked at HSBC, died at Killynure. Robert Brown, b. abt. 1885 - never married, emigrated to Canada and worked for the CPR. Sarah "Blin" Margaret BROWN, b. July20, 1886- lived at Killynure and ran it in her later years. Herbert E. Brown, 1890 - emigrated to Canada and died in Ontario. The two portraits above and the photo of Killynure beneath both come from the collection of Dianne MORGAN (great-grand-daughter). The family photo beneath was found October 2006 in the papers of Dorothy ROBERTSON (August 30, 1912-September 5, 2006), a daughter of Thomas Jackson BROWN. L-R Mary BROWN b. 1874, George BROWN b. 1877, Thompson BROWN b. 1868, Sarah Margaret "Blin" BROWN b. 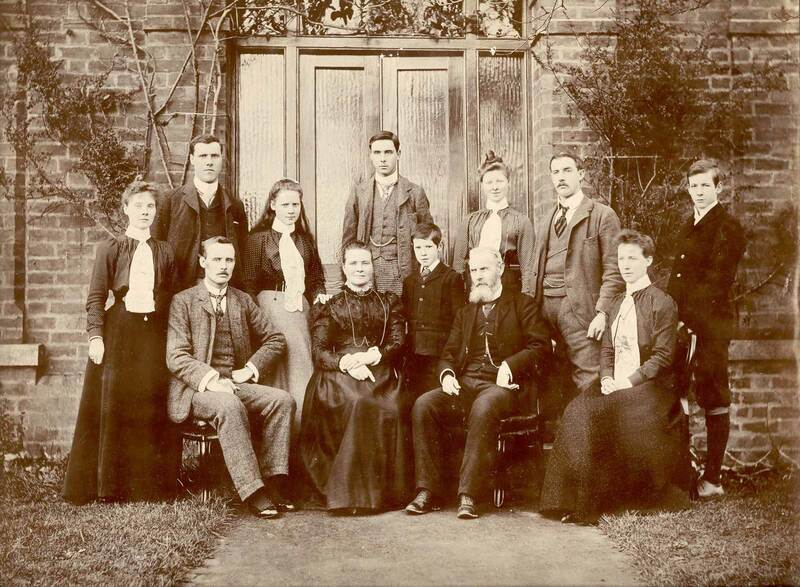 1886, mother Elizabeth BROWN (nee JACKSON) b. 1843; Thomas Jackson BROWN b. 1879 (my grandfather); Herbert Evelyn BROWN b. 1889; father Thompson BROWN b. 1837, Frances Olive BROWN b. 1881, DAvid BROWN b. 1872; Elizabeth BROWN b. 1870; Robert BROWN b. 1884. A marriage notice appeared in the Armagh Guardian on January 18, 1867. "Jan 8 in Creggan, near Newtownhamilton, Mr. Thompson Browne, Dame St.,, Dublin to Bessie, eldest daughter of Mr. David Jackson, Wiker (sic) Lodge, Co. Armagh " We also have two letters from “Bessie” BROWN: one from the collection of Dorothy ROBERTSON (grand-daughter); the second from the collection of the aforementioned Dianne MORGAN. There are also various mentions in the letters writen by Eliza OLIVER to her son Sir Thomas JACKSON (brother of the Elizabeth JACKSON who was the wife of Thompson BROWN). The first of Bessie's letters is dated October 26, 1915 and is addressed to "Bessie's" son, Tom (Thomas Jackson BROWN). It announces the death of her husband, his father. It seems he died peacefully, perhaps of a stroke, after a time of becoming progressively more feeble. She mentions that both “Bessie”(one of her daughters - married to Samuel GILMORE) and Thompson (one of her sons) were wired. It would seem that they didn't live too far away as they came to join their mother and the brothers and sisters who were already there - Mary, George and Herbert. Dr. MCBRIDE also attended the event of the death. He was likely Dr. William Scott MCBRIDE, the husband of Ethel Sarah GILMORE (just to keep things complicated, she was the daughter of Eliezer GILMORE and Sarah JACKSON who in turn was the sister of “Bessie”). The letter also describes how details of the will were read out and the girls each were to get £350 each, Herbert £300, Robert £100 and George and his heirs (of which he never had any!) was left the farm. “Bessie” BROWN Sr. got £50 a year plus the use of the house, etc.. There was also £500 pounds coming to her which was actually money which she had initially received from her brother David after he died. Her husband had invested it in his name (as would have been the custom back then). Unfortunately, this meant that they had to pay duty on it. Presumably, this is what provokes her rant about Lloyd George - the incumbant Prime Minister: “all the extra duties & expenses that Lloyd George has invented to rob this widow and orphans ...” - all of which conspire to make it hard for her George to run the farm in such a way as to pay off all the bequests. She then goes on to say that her sister, “Peggy” (Margaret McCULLAGH nee JACKSON) had been with them for the last days of Thompson Sr.’s life. After the death, “Mollie”had motored down and brought them all to Urker. Although this "Mollie" could be Mary MCCULLAGH, the daughter of Margaret MCCULLAGH, née JACKSON, it is more likely to be Mary WRIGHT nee MENARY who lived at Gilford Castle and was known to have both a car and driver. 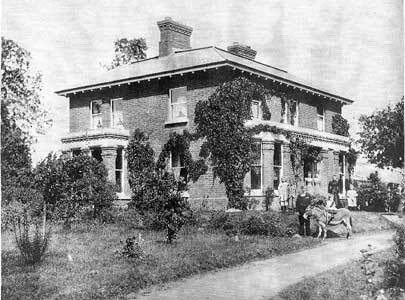 The plan was that they were going from there to stay with Thompson Jr. & Aunt “Peggie”, presumably at Slieveroe. (Why Thompson Jr. is at Slieveroe, we don't know). The second letter, dated July 27, 1922, is also addressed to her son Tom (Thomas Jackson BROWN). She is clearly still living at Killyneur and he is living temporarily at Ardglass while his wife cares for her aging parents. It is a chatty letter, mostly congratulating “Jack” (Thomas Jackson BROWN Jr.) For his good grades on exams for entrance to quality schools. She also mentions that a“Mollie Wright” had dropped in the day before. This is probably the aforementioned Mary WRIGHT, née Menary who was the daughter of Mary JACKSON and hence a niece of “Bessie”. There is also mention of a letter from Alice. 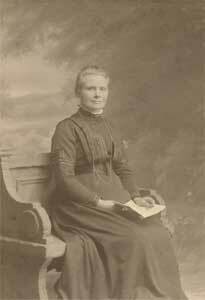 This is possibly Alice RICKETT, the wife of David BROWN who is expecting to visit in August. The visit will be Alice's first since the death of David (whodied July 13, 1919).”Fan” who is likely to be Frances BROWN has apparently written to both Thomas Jackson BROWN and his brother Robert and not heard from either of them. There is also mention of Jim & Mabel BROWN who have also recently visited and walked “Bessie” “up and down the front of the house for nearly and hour every day”. I am guessing here, but I would suspect that he could be a brother of Thompson BROWN Sr. All in all, it is a sprightly letter from a woman who hasn’t much more than a year more to live at best (we are guessing on her date of death, but it was before Thomas Jackson BROWN and family returned to Canada in 1923). This all tied together when I received (thanks to the great kindness of strangers - in this case, Peter McWilliam), a copy of the marriage certificate. Here the address of Thompson BROWN is given as 60 Dame Street, City of Dublin, Parish of St. Andrews and his father's name is given as Samuel BROWN (Gentleman). Thompson's profession was also given as "Merchant". This ties in with other information: Thom's Directory of Dublin, 1868 shows Brown of Wholesale & Retail Linen and Woolen Drapers, Haberdashers, Hosiers, Glovers, Lacemen, Silk Mercers etc. #59-61 Dame Street. This is also listed as "Brown, McConkey & Co. (also at 1& 2 Eustace St.). The link here is strengthened by the fact that an M.McConkey was also a witness to the wedding as was Jas Oliver (who would likely have been representing the JACKSON side of the marriage). Of further interest is that the officiating minister was none other than Daniel G. Brown - another instance where the final"e" in BROWNE is discretionary. I have also been focusing on Smithborough, Co. Monaghan as a strong possibility for other BROWN relatives since Thompson BROWN jr. took up residence there after his stint at HSBC. 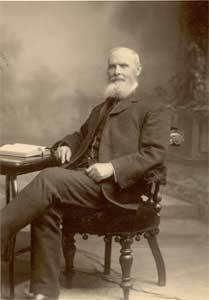 There is also another possibility that the Samuel BROWNE - the father of Thompson BROWN - is related to Daniel Gunn BROWNE. There are a few deeds that raise the possibility to me that they might have been brothers. Contemporary Biographies Edited by W. T. Pike Pike's New Century Series. Publishers: W. T. Pike and Co., 19, Grand Parade, Brighton. 1909. Brown. - THOMPSON BROWN, J.P., Killynure House, co. Armagh; son of the late Samuel Brown, of Ednafirkin, Ballybay, co. Monaghan; born in 1837. Farmer and landowner; breeder of horses, cattle and sheep; Justice of the Peace for co. Armagh; late Vice-Chairman of Board of Guardians and District Council. Married Elizabeth, daughter of the late David Jackson, of Urker, and has issue six sons and four daughters. * Note. P. 43 of Full Circle there is mention of a James OLIVER of Ednafirkin. This is of interest given the witness to the marriage of Thompson BROWN & Elizabeth JACKSON. * At the Ford of the Birches. Samuel BROWN, Drumfaldra, died March 14, 1911 age 68 years. His wife Elizabeth died 6th February 1934. Their sons Robert died 1918 aged 25 years. Alexander died 4th February 1971 aged 84 years. His wife Isobel LOCKART died 4th April 1963 aged 77 years. I wonder if he might be a brother of Thompson BROWN. Death of Mr. Thompson Brown, J.P. It is with the greatest regret that we announce the death of Mr. Thompson Brown coma J.P., Killynure House, Armagh. He had been in poor health for a long time, and passed away peaceably at the right old age of 78. Mr. Brown was a member of the Board of Guardians before the Local Government act came into operation, and afterwards was elected to represent his local division. He was also an energetic member of the Agricultural Committee in its earliest years, bringing to it the ripe experience of a go-ahead farmer, and successful businessman. He was Chairman of the Board of Guardians during the stormy period of the Roman Catholic discussions, which were marked by scenes, acrimonious passages, and all the efforts that craft and well engineered, and well instructed members could bring to bear. Only a chairman possessing a judicious temperament could have conducted the business properly through and protected the ratepayers at these meetings, but Mr. Brown proved himself fully capable of a very difficult task, and never permitted himself to be led into illegality or lose his temper. On the newly formed Rural Council he was a great assistance in helping his fellows to meet the new duties cast upon them. Shortly afterwards he resigned all public positions to enjoy a well earned rest. He was a leading member of First Armagh Presbyterian Church, and in every way enjoyed the respect and esteem of all who knew him, kindly, generous, liberal, broad-minded, and upright in all his ways and dealings. His death removes one of the old generation of whom we are so proud to have still with us. At the Presbyterian Cemetery just outside Armagh City (Fairview Cemetery), there is a square concrete perimeter with the single name "BROWN" inscribed. This is where we believe that the Browns of this generation were all interred. Regrettably, from the perspective of people like myself, there is no further information inscribed on the marker. Thompson BROWN had the current house at Killyneur built for his family, which is still largely the same as it was then (see photos of it in the late 19th century and then a hundred years later). It can be seen from the road two miles past Milford on the road to Monaghan, in a dip in the landscape popularly known as Brown's hollow. Family memories of the house at Killyneur include a toilet with a delft blue pattern and bell pulls for the maid in all of the bedrooms.The current owners are Edgar & Amanda Knox. Amanda’s parents bought the house when Blin had to sell (because of advancing age and difficulty of upkeep). They bequeathed one half shares each to Amanda and Edgar who both actively farm the land and keep it up.